3/26/2011 - This is the kind of card that makes a lot of sense thematically, but very little otherwise. Why should black get a conditionally very strong defensive card like this? 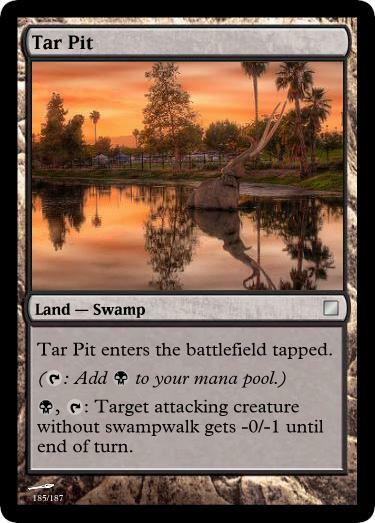 Is it fair that it enables Swampwalk and can't deal with it? How weird is it that it affects flying creatures? Ultimately, you wouldn't expect to see a card like this get printed today. To bring this close to a plausible card, I think it'd most likely be printed as something a bit closer to the Mistveil Plains cycle. By which I mean the ability would be something more like: B, T: Target nonflying attacking creature gets -1/-1 until end of turn. Activate this ability only if you control 4 or more swamps. I feel like they basically did this card already with Quicksand, although I bet they'd make it -1/-1 if they could redesign the card. 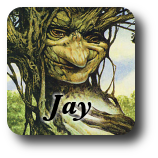 I'm assuming Jay's intention is to create a fair-yet-repeatable land-based removal. Otherwise, yeah, Quicksand does in fact exist and covers almost identical flavor territory.